As our semester winds down (well up in regard to schoolwork and finals and whatnot!) this blog will be slowing down. This does not mean that Project Africa is slowing down, if anything we are already getting ready for next year and we have some ways that you can keep up with us. This week’s top five are all ways you can be involved with Project Africa. Every Tuesday we send out a newsletter. This newsletter provides a quick look and a detailed list of events happening in about a two month range at The New School and within New York City more generally, but the events are all Africa related. This is also the easiest way to get updates on Project Africa stuff and event details for our own activities. 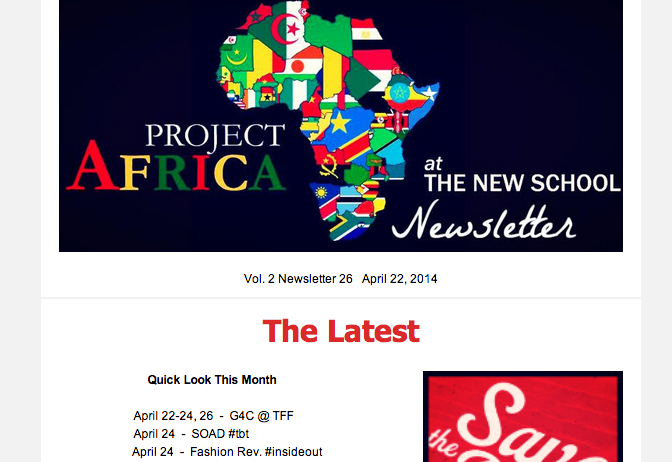 You can email us at ProjectAfrica.NS@gmail.com and tell us you want to subscribe or click here! 2. Like Us and Follow Us, ETC. We are all about the internet, The New School is a big place and sometimes its really difficult to get people together for a meeting and we also like to share stuff we find throughout the week. Project Africa has come back from a period of defunct-ness a couple of semesters ago, but one thing that hasn’t managed to make quite the comeback (yet!) is this blog. So we are taking the summer session as an opportunity to try something new. This may mean moving from a blog to an online magazine publication that publishes less often but more content in one go. If this sounds like an interesting endeavor and you want to contribute to the conversation and or be involved in any way, please sign up for an online interest meeting . 4. Come Up With A Name! If we are able to move forward with the publication and move away from a blog we need an awesome name. So come up with one! We have a lot of things we are working on, but we always want to be focused on what our members and those interested in PA would like to see us do. If you have any suggestions please drop us a line and let us know what you are thinking! You can email us at ProjectAfrica.NS@gmail.com.